Appliqué is a great method to choose for corporate logo flags, military guidons, school/organizational banners and personal boat pennants. Click on the links below to view some samples of appliquéd flags we have made. Custom military guidons are made to military specifications. 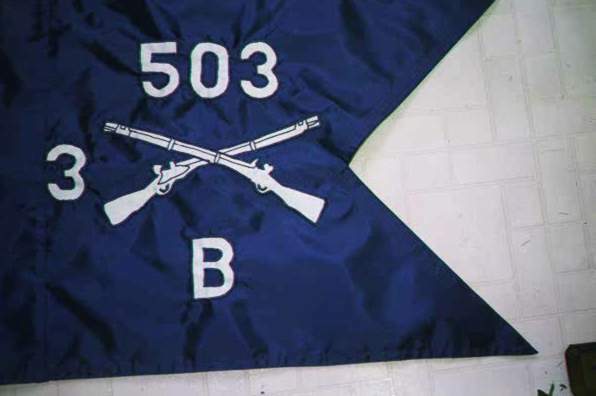 All nylon custom guidons are 20″ X 27 3/4″ with letters/numbers reading correctly on both sides. Finished with a pole hem and tabs. Made to order. Average lead time for a custom made guidon is 3-4 weeks. (note: When ordering Military Police and Quartermaster guidons please order by color choice see color chart) If you do not see your service guidon listed please email custom@flag-works.com or call 1-800-580-0009 for a quick quote on making the custom guidon. Most unique custom guidons fall in the class A thru C price guides. This entry was posted in Military Guidons and tagged custom, custom applique, Custom Applique Flag, Custom Flags, Custom Nylon Flag, Flag-Works, Made in the USA, Military Guidon, Military guidons, Nylon on June 7, 2016 by admin. 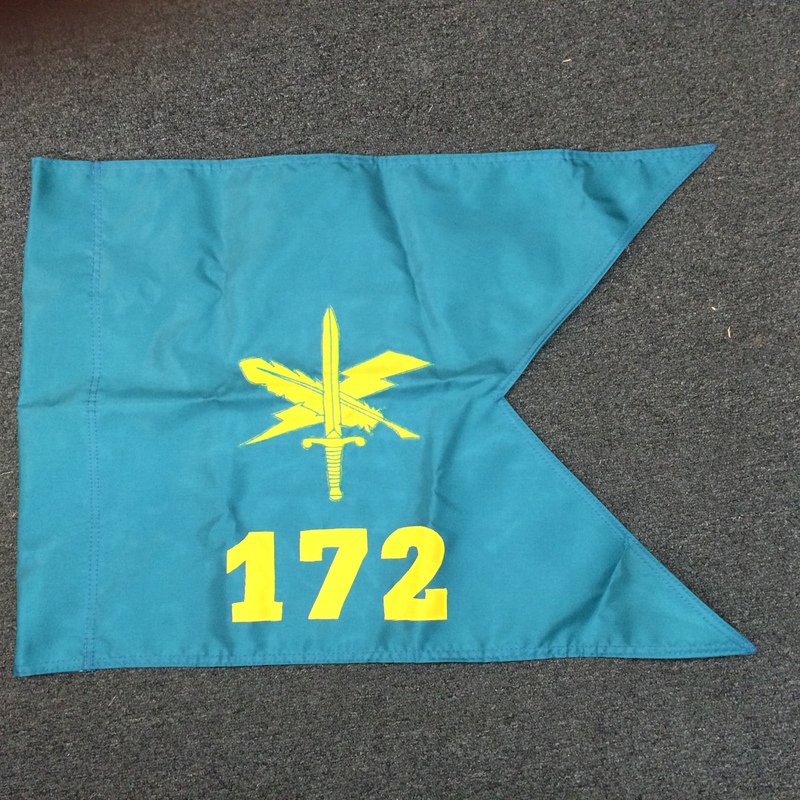 Custom Guidon– Public Affairs for a local Military Facility in Vermont. This Guidon was in a need of a rush production and it happened. With in a day it was made and shipped to the customer. This entry was posted in Custom flags, Military Guidons and tagged custom applique, Custom Guidons, Custom Military Guidons, Custom Military Guidons Applique, Flag-Works, Made in the USA, Military Guidon, Military guidons, Nylon, nylon custom guidons on February 11, 2016 by admin. Guidon Poles – Our Guidon poles are the finest quality ash finished guidon poles available. 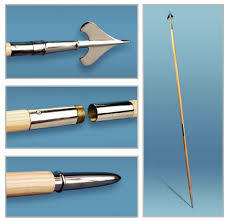 Poles are available in 7′, 8′ or 9′ x 1 1/4″ and come with a pointed bottom ferrule and an army spear. 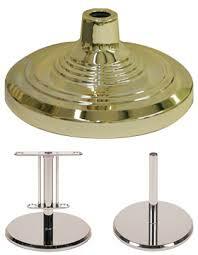 Finishes available in brass or chrome. This entry was posted in Guidon Poles and Bases, Military Guidons and tagged Flag-Works, Guidon Bases, Guidon Poles, Military Guidon, Military Guidon Bases, Military Guidon Poles, Military guidons on September 22, 2015 by admin. Flag-Works over America has been commissioned to make Air Force guidons for the 412 MDG unit at Edwards Air base. The Guidons have a blue field with two swallow tails and an eagle in the center. The numbers above the eagle designate the parent unit and the alphabetical portion below the eagle designates the squadron. (click to view proof FW Airforce17a) All of our guidons such as, Calvary, Military Police, and Infantry are made to military specifications using two pieces of nylon (no patches) for the designation to be read correct both sides and the insignia is sewn through the nylon to create a single reverse insignia, all per specifications. Flag-Works has been making Military guidons for over 16 years. We have made many custom guidons and many standard for almost every branch of service. A list of some are: Signal Corps guidon, Armor guidon, Medical Corps guidon, Corps of Engineers guidon, Quartermaster corps guidon, Ordnance guidon, Special Forces guidon, Chemical Corps guidon, Anti Air Craft guidon, Field Artillery guidon, Air Defense guidon , JAG guidon, Marine Corps guidon, (Rectangle shape) and Transportation guidon. If I missed any we can make it. This entry was posted in Military Guidons and tagged Air Defense guidon, Anti Air Craft guidon, Armor guidon, Chemical Corps guidon, Corps of Engineers guidon, Field Artillery guidon, guidons, JAG guidon, Marine Corps guidon, Medical Corps guidon, Military Guidon, Military guidons, Ordnance guidon, Quartermaster corps guidon, Signal Corps guidon, Special Forces guidon, Transportation guidon on August 16, 2012 by admin.